#NewYearNewMe may be all about health and fitness, but reading challenges are a thing of habit to me by now. 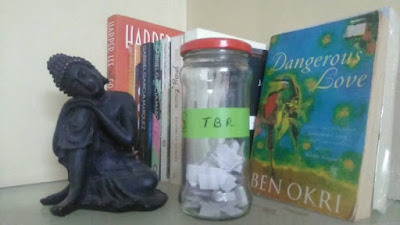 This year, again, I’ve devised my own reading challenge. The challenge contains books I already own, to make sourcing easier. There’s also an affinity to Indian writing that I can’t get over! Based on these, I made a TBR jar for 2017, in which I put in 52 titles under these headings. I read a total of 161 books in 2016. 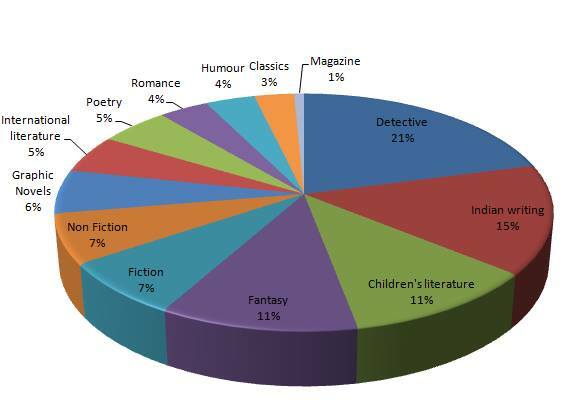 Most-read genres: Detective fiction (21% of 161 books), Indian writing (15%) and Children's literature and Fantasy (11% each). I've liked 66% of the books I read (rated 4 and 5 stars on Goodreads). My most-read authors were Roald Dahl and Lilian Jackson Braun with 6 books each. As for the #2016ReadingChallenge that I started with a friend at the beginning of the year, here's what I managed. I haven’t read many M&B. I think this is just my second. But yes, I’ve read a few romances that fall into this category. I haven’t enjoyed any of them much, because they are NOT my cup of tea. I can only read so much about damsels in distress or even not in distress and knights in shining (or not) armour. There is only so much tough-guy-delicate-girl that I can consume without insulting my sensibilities. 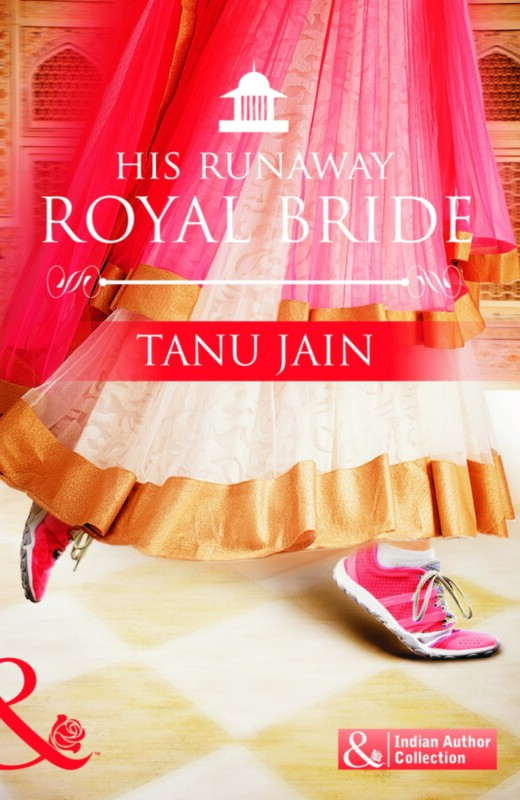 I received His Runaway Royal Bride by Tanu Jain as part of a giveaway. I read it only because of the moral obligation I felt towards the author for having sent me signed copy. Reading about the conservative royalty in a modern set-up was regressive to say the least. I am from a royal family personally, so I know that the world now longer works on the basis of titles and family heritage! There are hardly a handful of royal families in India that still attract the “ji huzoors” and “Maharani saheba” deference. However, to be fair, despite the titles, the family dynamics were quite similar to any average middle class Indian joint family – the rumour-mongering, jealousy, conservativeness, spite. I thought it was twisted and perverted the way the lead characters – Meethi and Veer – are supposed to feel wildly attracted to the other when on the same page a few words above they had been seething in anger, fear or distrust. I skipped over most of the description of the sexual attraction and action between Meethi and Veer – the descriptions were clichéd, and added nothing to the story. There was way too much stress on the beauty and handsomeness of the characters and every little thing seemed to lead to sexual action. Even going clothes-shopping could not be spared the throbbing members and explosions of lust! Loins, throbbing member, melting in the arms, tight erection, strong hands, sweet spot, thrusting, feeling of vulnerability… nah, not how I’d like to understand the characters’ passion for each other. Where do we draw the line between erotica/pornographic literature and a Mills & Boon? The plot, however, was pacy and this was a quick read overall. Much of the elements of the book, however, appeared clichéd to me. In short, I did not enjoy reading this. But for the teenagers who like to fantasise, this could be a feel-gooder. I received this book as part of the Tornado Giveaway 2 by The Book Club. Trudi Canavan’s The Black Magician trilogy comprises The Magicians’ Guild, The Novice and The High Lord. The story revolves around Sonea, a slum girl who is found to have high magical potential, and the fate of Kyralia, her land, which is under threat from the black magicians of Sachaka’s wastelands. *There might be spoilers ahead – proceed with caution. It is the way the story moves that makes The Black Magician trilogy an interesting read. Book 1 – The Magicians’ Guild – was slow-paced. The first part describes the efforts of Sonea to escape the Guild’s capture, the misunderstandings between the Guild and the dwells, and this went on and on and often got boring. The key themes here are the class difference in Kyralia and the fears of acceptance and rejection. The second part, when Sonea is captured by the Guild and taught to control and use her magical potential, is more interesting. We learn that the Guild is not as bad as anyone feared. In the second book – The Novice – Sonea begins her magic lessons at the University and discovers that she is stronger than most other magicians. The class differences and the sense of privilege of the rich are highlighted again through the activities of the bully Regin and his followers. We don’t see much of the Thieves or the dwells. But soon the book stops being just about Sonea’s development. Political undercurrents become strong, the danger of black magic becomes prominent, Akkarin’s activities become more sinister and grey, and the safety of the Allied Lands is about to be breached. The plot separates into Lord Dannyl’s quest towards the “higher knowledge” gained by Akkarin and his Ambassadorial activities in Elyne (as well as questions about homosexuality) on the one hand and Sonea’s classes and magical growth on the other. The third book, The High Lord, was incredibly long, and could have been marketed as two separate books. However, the plot was fast-paced and had enough twists to keep the anticipation high. In this final book, we find that the Sachakans are the real threat to Kyralia, and the political implications are higher. There’s method to Akkarin’s madness, one that cannot be explained easily to the Guild or even to Akkarin’s best friend, Administrator Lorlen. While the first two books stayed quite safe of love angles, it is one of main themes in this one, and I will not deny that it is corny. However, I wanted the pair (won’t say who!) to be together and find happiness in adversity. I did not expect the ending, however. I may even have shed a tear or two. Characterisation is one of Trudi Canavan’s victories. She manages to build up reader sympathy towards almost all the characters in the series: from the protagonist Sonea to her benefactor Lord Rothen and her tormentor novice Regin, from the “Thieves” Ceryni and Faren to the magicians Lord Dannyl, Lord Fergun and Lord Lorlen, from Elyne citizens Tayend and the various Dems to High Lord Akkarin, from Lord Rothen’s helper Tania to Akkarin’s servant Takan, from Sonea’s aunt Jonna to Gol, Cery’s watcher. You can easily imagine each of them in flesh and blood. Sonea’s character in The Novice was a little too meek for my satisfaction, though. I agree that this built on the ending of The Magicians’ Guild where she gives in to Lord Fergun with too much caution and timidity just because she did not know how powerful she was and how many allies she had. I wasn't very pleased with her way of dealing with the bully Regin. I thought she was too meek and diffident. It almost seemed as if she cannot form a functional strategy on her own. She needed alchemist Lord Rothen until he was her guardian, and later her best moves came with the help of healer Dorrien. However, in the first and third books, she is strong, confident and stubborn. Akkarin’s character is rightly made mysterious, and he emerges as a reluctant hero by the end of the books. The confusions and fears of Dannyl and Tayend, and Rothen, and Lorlen, are well captured too. However, IMHO, Canavan doesn’t build the “villains” up very effectively. Though everyone keeps asserting the Sachakan magicians’ strength, we don’t get a rounded study of Kariko or the other Sachakans. A small glimpse of Kariko’s diabolical nature came only when he confronted Rothen and made a bloodstone for him to watch the destruction and death of Kyralia and its magicians. Mindless killing doesn’t make a villain formidable – it’s their amorality or skewed morality that makes them so. We do not get that sense of evil wholesomeness in the Sachakans. From standard plotlines, anyone can guess that Sonea will emerge as the heroine and save Kyralia. Just like we knew Harry Potter would save the magical world and won’t die in the end. The Black Magician trilogy reminded me of the Harry Potter series in so much as it is a young orphan discovering magic and magical strength and dealing with growing up with magic. However, that’s where the similarities stop. Sonea came from a loving family, just a tad poor, while Harry’s family was cruel to him. Sonea entered the magical world with no friends or support (except her mentor Lord Rothen’s), while Harry was loved by more than half of the magical community and everyone helped him throughout the way. Compared to Sonea, Harry’s life was too easy. He had friends, loving and encouraging teachers and just one enemy – Voldemort, who was disliked by almost all. Sonea has no friends, and even the enemy she has to fight against becomes a real threat to the magical community only towards the end. The magical world created in The Black Magician trilogy, however, is not convincing enough. The story is set in a fictional country called Kyralia, which is ruled by a King and a Guild of Magicians. The Allied Lands include Elyne, Vin and Lan islands, and Lonmar. Sachaka is not part of the Allied Lands and is separated from Kyralia and Elyne by a wasteland that was created during a magicians’ war centuries ago. All that is fine. But I felt that the attempt at creating a new set of words for flora and fauna - ceryni and ravi for rodents, faren for spiders, bol, raka and sumi for beverages (while still maintaining the term wine) – was quite feeble, almost forced. It would have made no difference to the plot if the names weren’t in another “language” or whatever it is that the author envisaged them as. When a novel is categorised as 'Romance', I tend to view it more as a feel-good, chick-lit story with high predictability of storyline. Since that is not the kind of works I like to read, it takes a lot of motivation for me to pick it up. Paulami Dutta Gupta had sent me an e-copy of A Thousand Unspoken Words a few months ago in return for an honest review, and because of my prejudice against romance novels, I kept off the reading for so long. But once I started reading, I realised that this was not your average mushy romance. A Thousand Unspoken Words is literary fiction, if I HAD TO label it, but otherwise I'd just leave it at being a very good story, well-told. This story doesn't have heroes and heroines. Riddhimaan and Tilottama's love story is not a story of battles with family or society, but it's a story of battling with one's own demons. In this story, Riddhimaan is not a prince charming and Tilottama is not a damsel in distress. If anything, this love story is as close to reality as one can get without being melodramatic about romance. 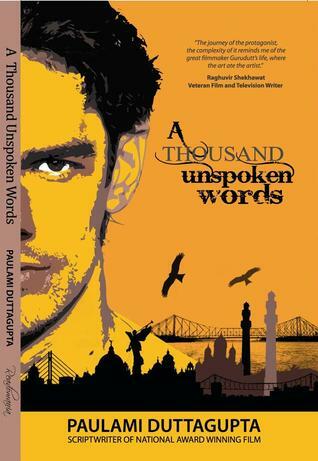 Riddhimaan is an idealist who turns into a materialist after a terrifying brush with harsh reality. Tilottama is an idealist who is in love with the idealist/Leftist writer Musafir, the pseudonym taken by Riddhimaan. When Tama and Riddhi meet after Musafir/Riddhi has transformed into the materialist, there are sparks of attraction, but a lack of conviction too. Tama finds it difficult to come to terms with the changed ideologies of Riddhi, and the writer is not able to reconcile the differences in the personalities of Musafir and Riddhimaan. Both have to deal with their demons before they can take their paths forward together. The victory of A Thousand Unspoken Words is that Riddhimaan is not a hero and Tilottama is not a heroine. They are normal people to whom things happen. The question is whether you can deal with it or not. And in that sense too, neither of them are noble and sacrificing and epitomes of anything. They deal with things, make mistakes, try to correct themselves, and learn with every step. Their story is backed by supportive characters like Riddhi's mother Krishnakoli, his sister-in-law Mimi and Tama's father Shoumo Sen. The characterisation in the novel is really well done - well-rounded. Tilottama is stuck with ideals of younger years, self-righteous, judgmental and doesn't easily let her hair down. Riddhimaan is fun-loving, stubborn, slightly egocentric, and constantly confused over the rift created within his identity through Musafir. Shoumo Sen is living in the past, crying over the spilt milk of his estate in Darjeeling, but supportive of his daughter and trying hard to move on. Krishnakoli loves her son and wants him to be happy, while being a mother to almost everyone else too. Every little character presented to the reader comes with a personality, and not as two-dimensional pictures. What could have added a little bit more substance to the book is a stronger reason or trajectory of Musafir/Riddhi's transformation from the idealist to materialist. I somehow found it difficult to believe that just being attacked and hounded by people who hated his writings could have changed him so drastically. I was drawn to the Alphabet Soup for Lovers after reading some of the excerpts posted by two of my bibliophile friends. The food allegories were so simple that they were tempting. I've never read any whole novel of Anita Nair before, and having heard praise for her from many friends, the excerpts had an immediate effect. I ran to Amazon the moment the prices dropped and bought myself a copy. Neither did I wait too long to start reading the Alphabet Soup for Lovers. I started reading it in train on the way to Kudla from Bangalore and unfortunately, also finished it in two days. I wish it would go on and on, I wish Anita Nair was tackling Malayalam alphabets - at least then we'd have had 52 chapters and not just 26. Alphabet Soup for Lovers is a simple tale - of how Lena Abraham finds love. Lena and KK, her husband, run a tea plantation and a small homestay in the lap of the Annamalai hills. Their marriage is placid, free of passion or arguments. But when Shoola Pani, the Tamil superstar, comes to stay in the homestay, Lena's life takes a new course. Passion and love, which Lena carefully skirted around all these years, come bursting forth from her bosom. "Arisi appalam doesn't puff up like a pappadum or a puri. Instead it turns a beautiful crisp white. It's full of flavour. Of green chillies and asafoetida, lime and the heat of the sun, and each bite is like a firecracker bursting in the mouth... Leema and her husband KK...are like store-bought appalam. Seemingly perfect but with neither flavour nor taste. Leema, you need an arisi appalam in your life, I want to tell her." In other parts, it is narrated in third person, where we get glimpses into the head and heart of both Lena and Shoola Pani. They are battling their own demons as their friendship fast-paces itself into a relationship that takes everyone by a storm. The narrative is like the flow of a river. It is heart-rending without being melodramatic, plaintive without howling. Though I would have liked an ending to Komathi's story just as Lena got hers, I have to admit this book plucked the chords of my heart like none other recently.